Back in May, while reporting a cover story on the 2012 political landscape in Ohio, I decided to follow up on a article done last year by Toledo Blade reporter Tony Cook, noting the large number of donations from employees of a North Canton direct marketing company called Suarez Industries to Republican Senate candidate Josh Mandel, who is challenging Sherrod Brown, and to Congressman Jim Renacci, who is running against Democratic Rep. Betty Sutton in a redistricted seat in northeast Ohio. It’s against the law for employers to reimburse their workers for political contributions, and I decided to look up some of the employees and ask them if that had happened in this case. It was while doing so—visiting decidedly modest homes whose owners had made $10,000 or even $20,000 worth of donations to the two campaigns—that I discovered that I was not the only one curious about the donations: the FBI had launched an inquiry as well. U.S. Rep. Jim Renacci says he has returned $100,000 in questionable campaign cash, reversing plans to keep the money pending the outcome of a federal probe. Renacci, a Republican from Wadsworth, disclosed his decision late Friday in an open letter to U.S. Rep. Betty Sutton, his Democratic opponent in a closely watched general election battle made possible by congressional redistricting. Sutton, of Copley Township, had criticized Renacci for not renouncing $100,000 in contributions from Canton-area businessman Benjamin Suarez, his employees and their spouses after the FBI began investigating whether donations were improperly funneled through Suarez. 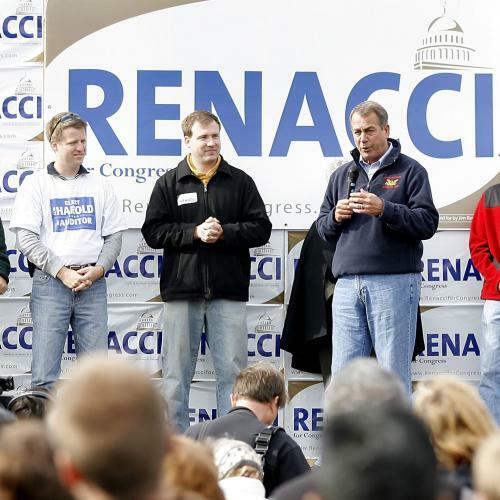 The Democratic Congressional Campaign Committee also had hammered Renacci. Toward the end of his seven-paragraph missive, which accused Sutton of “gutter politics,” Renacci wrote that he gave back the money sooner than planned to “take that tool from your hands” and deprive her of a campaign issue. “Your time [has] run out, the excuses are all gone, and you owe it to the people of this district to finally run on your record and the issues facing our community,” Renacci wrote in the letter, which his aides distributed as a news release. Renacci’s impressive attempt at spin aside, the FBI inquiry has caused real headaches for him and Mandel, allowing their opponents to cast them as playing outside the rules. Sutton is still demanding to know why Renacci waited to return the money until six months after first learning of the FBI inquiry. Mandel has come under widespread fire from Ohio editorial pages for a slew of questionable tactics, which may help explain why he continues to trail Brown despite the onslaught of outside spending on his behalf. To me, it all goes to show that basic accountability journalism can still make a difference. After my piece appeared, I wrote a post in this space raising the question of why Ohio reporters hadn’t made the minimal effort needed to follow up on that initial Toledo report, and come across the FBI inquiry themselves. The Columbia Journalism Review followed up by reporting out this exact question and laying bare just how decimated the Ohio press corps has become. But after my article appeared, the Ohio papers did follow up, and kept at it, with the result that some highly questionable campaign donations are now back in the hands of people who in all likelihood were not making them of their free will in the first place.